Teepees not only look totally amazing they also provide a fabulous ambience to any event. Whether you are having an intimate dinner party, corporate function, celebrating a birthday or planning your destination wedding, a teepee is the perfect venue. Our Nordic teepee stands over 7m high and has a diameter of 10.3m with all the sides down and 13m with all the sides up and seats up to 120 people. It is truly eye catching and impressive and immediately gives the wow factor to any event, The unique design of the teepee also allows you to be able to lift all or some of the sides to allow the Whitsunday breeze in and take advantage of our spectacular views. 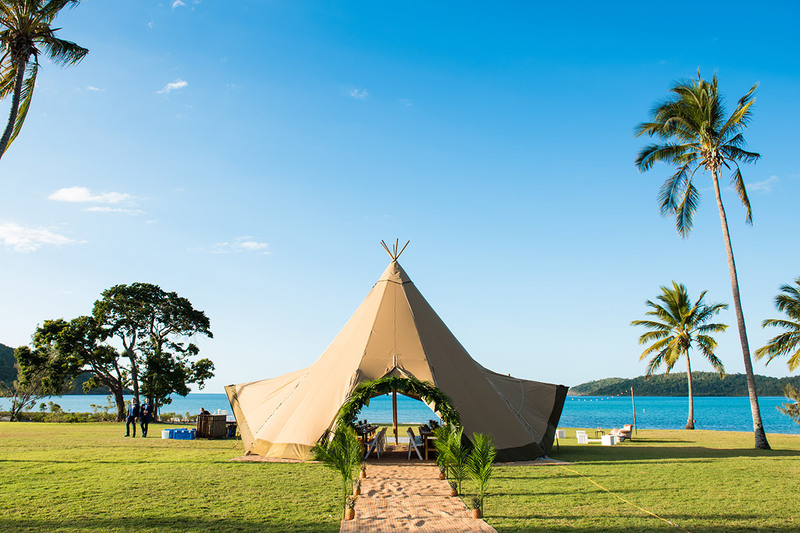 Located in Airlie Beach in the beautiful Whitsundays and servicing everywhere from Mackay to Townsville and beyond, If you were thinking about hiring a traditional marquee speak to us at Teepeevents Whitsunday to help make your celebration dreams a reality.